If you're tired of the "been there, done that" bar and party New Year's Eve scene in New York City, there are great, alternative New Year's Eve celebration ideas that will start your 2019 off right. From outdoor recreation to a night of music dance and fireworks, New Year's Eve in New York City​ has something for the whole family. Some require advance tickets and others, well, you can just show up. For a high-class night on the town, look to special New Year's Eve programming at esteemed performing arts venues like The Metropolitan Opera. At the Met, you can enjoy the performance and after-party complete with fireworks. Ring in 2019 at the premiere of Sir David McVicar’s new Met staging of Cilea’s "Adriana Lecouvreur," starring Anna Netrebko opposite Piotr Beczała. Gianandrea Noseda conducts. Dinner, dancing, and fireworks on the Mercedes T. Bass Grand Tier follow the performance. This is a co-production of the Royal Opera House, Covent Garden, London; Gran Teatre del Liceu, Barcelona; Wiener Staatsoper; San Francisco Opera; and L’Opéra National de Paris. The New York Philharmonic presents the beloved American soprano Renée Fleming, the New York Philharmonic, and Music Director Jaap van Zweden. The show will feature singing and dancing into 2019 with Broadway and film hits, Viennese waltzes, and operetta gems. Get the new year off to a running start — literally — courtesy of the NYRR Midnight Run in Central Park. The music and dancing start at 10 p.m. and the countdown to midnight starts, of course, at 11:59 p.m. with the runners taking off at the stroke of midnight. The casual and fun 4-mile run, sponsored by the New York Road Runners organization, starts near Bethesda Terrace at the stroke of midnight, featuring live DJs along the race route and a sparkling cider toast at the halfway point, all set underneath a scheduled 15-minute fireworks display in the park. Qualifying runners are eligible for cash prizes. 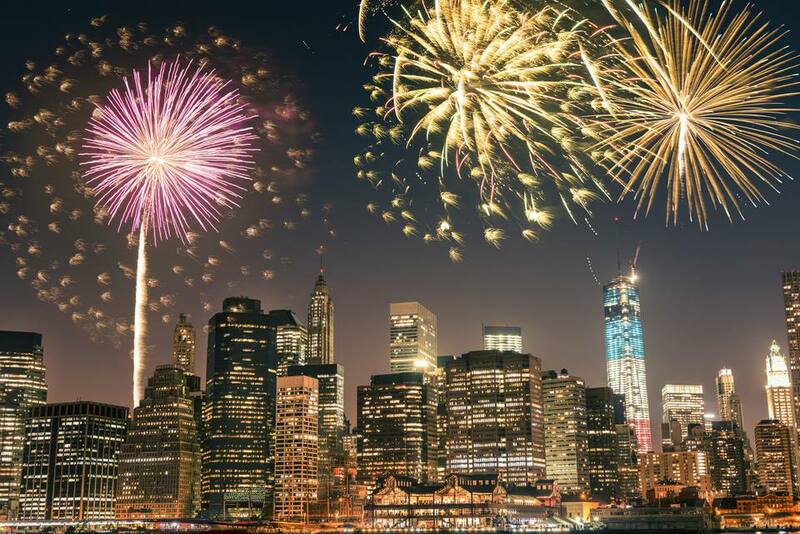 Head out into New York Harbor for a New Year's Eve to remember, complete with stunning Manhattan skyline views and a midnight fireworks display. Spirit Cruises, World Yacht, Classic Harbor Line, and Circle Line Sightseeing Cruises are among the local cruise companies offering evening sailing parties, dinner, open bar, live DJs, and more; plus, prime viewing for the festive New Year's Eve pyrotechnic display in the harbor. Bundle up and pedal your way into 2019, courtesy of the annual New Year's Eve bike ride hosted by the environmentally-minded group Time's Up. Participants in the event can join ranks with the rest of the two-wheeled gang (though skaters are welcomed, too) at the archway in Washington Square Park (at 10 p.m.), and then make their way through Manhattan before winding down at Central Park’s Belvedere Castle (at 11:45 p.m.). Revelers arrive just in time for an informal dance party with the group ("festive" dress is requested), as Central Park's midnight fireworks display gets underway. 10 p.m. - Washington Square Park Arch. Laugh your way right out of 2018 with several comedy and improv shows scheduled throughout Manhattan. Top options include the New Year’s Eve Spectacular at Carolines on Broadway, for two big shows featuring the country’s very best comedians. Wine and dine in their spacious showroom. The countdown to the New Year and ball drop is shown live on their 10-foot screen and plasma screen televisions. Enjoy party favors, a live DJ and dancing after midnight (10 p.m. show only). Also, try New Year's Eve at the Comedy Cellar with four shows and two locations. There will be a great line up of comedians and countdown and ball-drop festivities. 2 item food or drink minimum per person. Tickets are available online. Many restaurants are offering special New Year's Eve meals and entertainment. Families will enjoy the Times Square Bucca di Beppo family-style dinner from 7 p.m. to 11 p.m.
For something a little more upscale, Cote, the highly touted Korean steakhouse on West 22nd Street will have two New Year's Eve seatings. Hakkasan fine-dining Cantonese cuisine on West 43rd Street usually has a special New Year's Eve dining event.